So, as I’m planning my schedule for the NECC, I just realized a huge conflict: NECC pre-conference events are on Pride weekend. How am I to watch the parade and hear the opening keynote?! A little background on both events: The National Educational Computing Conference, NECC, is in Atlanta starting the weekend of June 23. 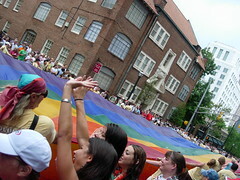 Atlanta’s annual gay pride celebration and parade are going on at the same time. This is great: just as 18,000 of my closest teaching friends descend on Atlanta, the gay community whoops it up for a weekend of celebration! The highlight of the weekend-long festival is the Pride Parade on Sunday. Marchers step off at 1pm from the Civic Center MARTA station. You may find this map of the parade route useful. The best spots to watch are along Peachtree St. near the intersection with 10th St., all the way to the end of the route in Piedmont Park. Even if you’re not gay, consider watching the Pride Parade. A word of caution, though: the crowds watching the parade get more raucous the closer you get to the end. If you want to drop in to see what’s going on, I suggest you try the intersection of Peachtree St. and North Ave. If you’re coming into town for the conference and want to skip the Pride celebration, avoid of Midtown Atlanta (from North Ave through 14th St).